Many of us crochet scarves, shawls, or wraps as gifts, donating them to organizations or presenting them to loved ones. Kristin Omdahl first began crocheting wraps for family members when she was living overseas. In Wrapped in Crochet, Kristin offers a variety of patterns in a multitude of techniques from Tunisian crochet and medallions to her signature infinity motif that will help you find the perfect pattern for a loved one in your life. One of the fascinating techniques Kristin features is hairpin lace. Hairpin lace or hairpin crochet was traditionally used for trims, insertions, edgings, collars, or to form rosettes that were used for tablecloths or along the edge of shawls. These days, this stitch is used to create entire skirts, sweaters, and scarves like the Tressa scarf, left. 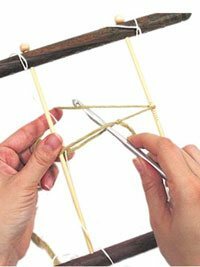 Hairpin differs from most crochet methods in its use of a frame or loom (available in craft stores), as demonstrated below. Why do we love hairpin lace so much? Besides its dainty and delicate feel that brings a lace-like feel to your fiber artistry, this crochet technique is quite trendy. It’s often used to create cool boho-inspired tank tops and overlays, and modern crafters have even started using the technique to make eye-catching dresses. You can give this technique your own special spin when you master it and add special finishes and colors. 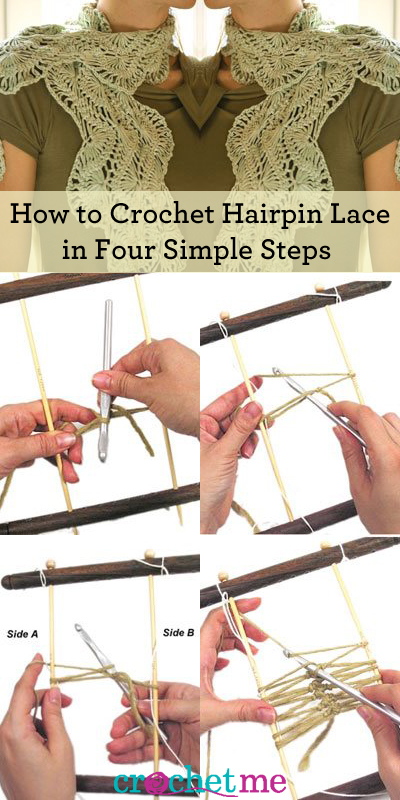 In this step-by-step guide, we’ll teach our tried-and-true hairpin lace crochet loom instructions with help of Omdahl. If you’ve been looking for that excuse to buy a loom, let this be it! 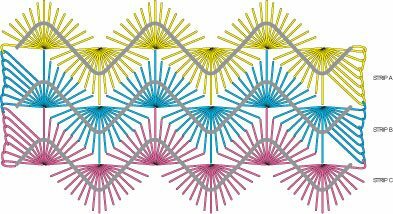 And don’t forget to scroll to the bottom of this page for some free hairpin lace crochet patterns that’ll help you put your hairpin lace skills to the test. 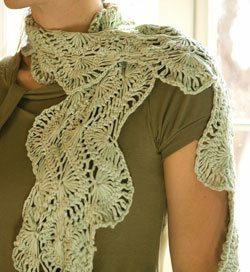 You can craft wraps, shawls and scarves using this method, and we’ve even got some hairpin lace crochet top patterns for those who want to go big! Hold the frame with spacer at bottom and rods 3″ (7.5 cm) apart. With yarn, make loop with slipknot and place loop on left rod (counts as first loop), with knot in center between rods. Yarn end wraps from front to back around right rod, and yarn from ball is in front of right rod. Insert hook through loop from bottom to top. Hook yarn and draw through loop. **Drop loop from hook, with hook behind frame. Insert hook from back to front through same loop (just dropped), turn frame clockwise from right to left keeping yarn to back of frame. 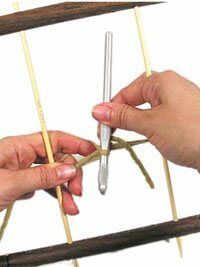 This allows the yarn to wrap around the frame without the hook getting tangled in the wrap, while retaining the position to continue stitching up the center. Repeat from ** to ** for desired length of strip. This photo shows what the strip looks like with about 10 stitches complete. Remember: You are crocheting in rows of 1 stitch-per-row vertical crochet. Discover for yourself the fun of hairpin lace! As our gift to you, you will find the pattern for the Tressa Hairpin Lace Scarf, at the end of this newsletter. And for more of Kristin’s beautiful shawls, wraps, and scarves pick up a copy of Wrapped in Crochet. Finished size: 6″ wide x 90″ long (15 cm x 2.3 m) without fringe. Tools & notions: Hairpin lace frame, set to 4″ (10 cm) wide; tapestry needle; split-ring stitch marker. Hook: H/8 (5mm) or size needed to obtain gauge. Gauge: About 2″ wide x 90″ long (5 cm x 2.3 m) = 1 strip of hairpin lace. Hairpin lace is very stretchy, so the strips may vary slightly. Rep Steps 1–4 at left until you have 270 loops wrapped around each of the rods. Fasten off. The loop joining technique joins two strips through one or more loops at a time without any additional yarn. 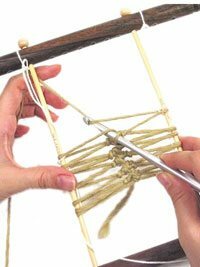 Use your crochet hook to pull the loops through. See Joining Diagram at left for assistance. Sk first 7 loops on Strip A (these will be joined later), draw next loop on Strip A through first 15 loops on Strip B. Pull next loop on Strip B through loop on hook, pull next loop on Strip A through loop on hook, continue to join loops alternating from B to A until 7 loops on each strip have been individually joined and you have a loop from Strip B on your hook. Pull loop on hook through next 15 loops on Strip A. Working in the One-to-One Joining technique (as explained above), join the next 7 loops from each strip together. You should have 30 loops from each strip joined together at this point. *Work in the Fifteen-to-One Joining technique with the next loop on Strip A and next 15 loops on Strip B. Work in the One-to-One Joining technique over the next 7 loops on both strips. Rep from * 6 more times, alternating which strip gets the 15-loop cluster. You should have 7 free loops rem on Strip B. Tack down the last loop with a tapestry needle and small amount of yarn. Fasten off and weave in ends. Rep technique for joining free loops on Strip B with the loops on Strip C.
Beginning with the first 7 unattached loops on Strip A, insert hook into first loop, *draw next loop through loop on hook; rep from * until 6 loops have been joined and the 7th remains on the hook, draw the first unjoined loop from the bottom side of Strip B through the loop on the hook, draw the next loop through the loop on hook until all loops have been joined, draw the first loop on the bottom side of Strip C through the loop on the hook. Tack down the last loop with a tapestry needle and small amount of yarn and fasten off. Rep technique for joining free loops on the second short side. Working with crochet hook on free loops of Strip A, join yarn in first loop, *(sc into loop, ch 2) 7 times, sc in next loop, (sc into next loop, ch 2) 7 times, sc15tog over the next 15 loops; rep from * to end, ch 1, work 21 sc evenly along end of 3 joined strips, ch 1, working in free loops of Strip C, **sc in next loop, ch 2, (sc into next loop, ch 2) 7 times, sc15tog over the next 15 loops, (sc into next loop, ch 2) 7 times; rep from ** to end, ch 1, work 21 sc evenly along end of 3 joined strips, join with sl st to first sc at beg of rnd. Fasten off. Fringe: Cut 66 strands of fringe, each 14″ (35.5 cm) long. 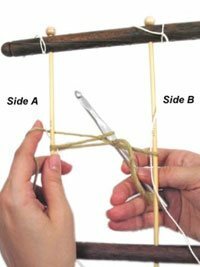 Holding 3 strands together, fold fringe in half. Using crochet hook, insert hook from WS to RS into first st along edge, pull folded edge of fringe through to make a loop, insert tail ends into loop and pull tight against edge. Work 11 groups of fringe evenly across each short side of the scarf. Handwash, block to finished measurements, and let dry. Enjoy this free crochet pattern, and check out more great wraps, shawls, and scarves from Kristin Omdahl in Wrapped in Crochet.